Main Sources: Gould, Frank, 1951, Grasses of the Southwestern United States, Tucson: University of Arizona Press; Shreve, Forrest & Ira Wiggins, 1964, Vegetation and Flora of the Sonoran Desert, Vol. 1, Palo Alto: Stanford University Press; Kearney, Thomas & Robert Peebles, et al, 1960, Arizona Flora, Berkeley: University of California Press; McClaran, Mitchel & Thomas Van Devender, 1995, The Desert Grassland, Tucson: University of Arizona Press; van Devender, Thomas & Mark Dimmitt, "Desert Grasses", in Phillips, Steven& Patricia Comus, eds., 2000, A Natural History of the Sonoran Desert, pp. 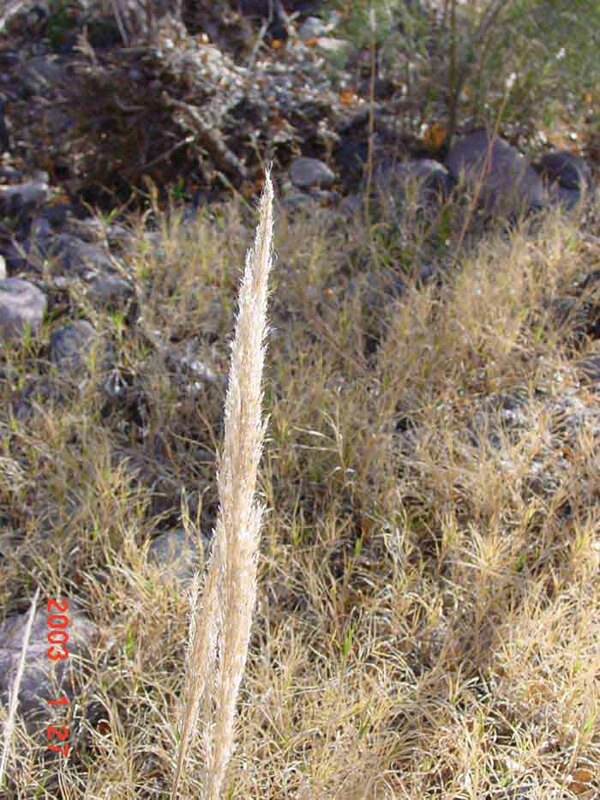 265-80, Arizona-Sonora Desert Museum Press, Tucson; Ruyle, George & Deborah Young, eds., 1997, Arizona Range Grasses, Tucson, University of Arizona College of Agriculture; USDA Conservation Districts of Southeastern Arizona,, n.d., Grasses of Southeastern Arizona. Washington, D.C. 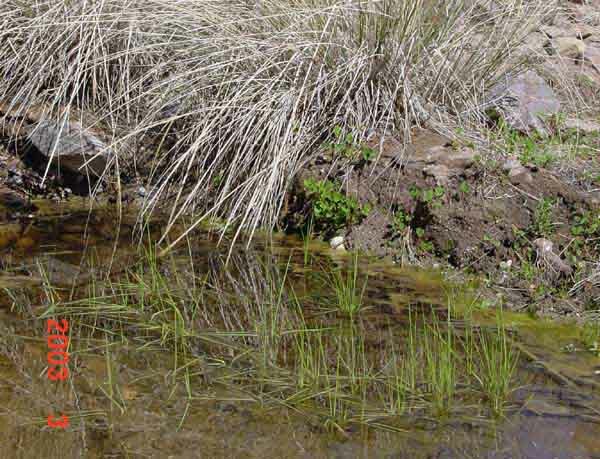 While in some parts of its distribution (Northern Arizona high country, for example), Deer Grass appears on dry plateaus and hillsides, in our area it is mostly found in gravelly or sandy canyon bottoms and washes where there is frequent enough flooding to sustain it. 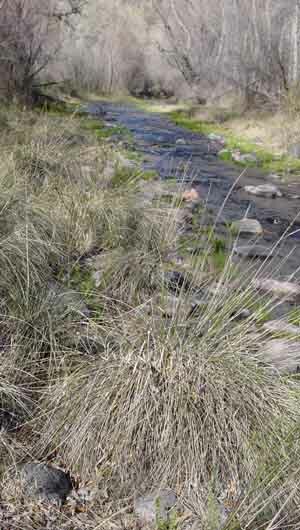 In those locations, however, it serves as a very important stabilizer of bank soils (see for example the banner photo above, taken just after a very considerable flood raced through Sierra Blanca Canyon Wash, depositing silt as it passed there, and below left, where its rootings in streamside rocks gives it strong anchor in a fairly narrow streambed). A tall perennial, with densely tufted stems (which soon become woody as they grow) reaching up to more than 3' high, Deer Grass has long-sheathed, hairless, firm leaf-blades which taper to fine tips. 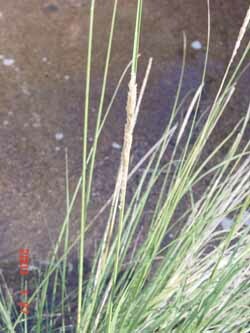 The seedhead is a long, narrow spikelike but open panicle. Here, below right, we see an example of last year's inflorescence (photo taken in January).Click on the image for a closer view of a larger example. 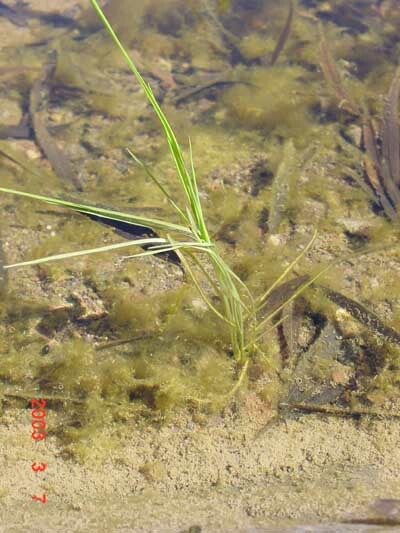 Below, young deer grasses sprout in the water directly below their parents, near Jim's Willow Spring. Further below: a closeup of one of these sprouts.